Dario Meets David Mairs – The Flying Scotsman! | Marbella Marbella – Adelante! I listened to Maurice Boland‘s hilarious live interview with an audacious 60-year-old man, who was just about to hurl himself from a Cessna, on his first parachute jump to help raise funds for Alzheimer’s Research. The “gem of a man” nervously waiting to jump, was David Mairs, a delightful person, blessed with good humour and talents. I met David at the glamorous Mijas Playa Restaurant, where he has been the resident musician/entertainer for more years than I can remember – a fitting testament to his popularity, success and staying power. Sharing the bonds of originating from Scotland, David born in Coatbridge and myself in Darvel, we were absorbed into the challenging, but exciting virility of Glasgow life and later, both working in the field of professional music and entertainment. David‘s career began when he played organ in his first band at 15yrs old and as his emerging talent became noticed by his peers, he worked with many top bands in Scotland and performed with names such as The Searchers, The Easybeats, The Tremelos, Love Affair, Edison Lighthouse and many more. He later emigrated to the Costa del Sol in 1991 where he met and worked with singer song writer Mel Williams arranging the music for Mel‘s stage productions “Professor Fossil” and “Don Zabatel” Then came live TV performing the music for Maurice Boland‘s breakfast show where he worked with Lonny Donegan, Mike McGere, Bonny Langford, Linda Nolan to name but a few. In May he and his wife, Linda, organised a charity event at Mijas Playa to raise money for Alzheimer’s Research and invited the cream of Costa del Sol‘s talent to help, with popular Maurice Boland of Radio TRE FM, compering the event. It proved to be to be a great success for the charity, the guests, and the artists, with super performances from exciting Johnny G., the harmonious voices of the gospels singers 2 True, followed by David‘s daughter, Scottish star Samantha Mairs, who performed a first-rate set with verve and energy, singing the campaign song “Marbella Marbella” supported by the gospel singers. Young Rebecca Tate sang two beautiful numbers that received a really warm reception, and topping the bill, was tenor Stephen Lloyd-Morgan, who despite a heavy cold, got everyone on their feet with an outstanding performance, finishing his show with a duet with Rebecca, singing “The Prayer” which received a standing ovation for their heart rending performance. Maurice Boland skilfully raised money with a raffle and auction, including a goody bag donated by the international band Smokie containing t-shirts, DVDs, CDs, and personally signed photographs of the band. David Mairs received €2250 with more to come, after the parachute jump in the way of pledges. Gareth Christian concluded the evening with an astonishing burst of musical energy that got everyone dancing. On top of all this, David Mairs writes a regular monthly feature for the elegant Costa del Sol Home Magazine and is a supporter of my campaign to promote Marbella and the Costa del Sol. 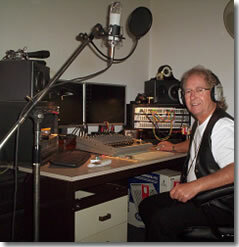 At the outset we set up “The Costa del Sol Voice” website, followed by a CD of original songs, titled “Living in the Sun” to help promote the Costa de Sol by using the power of music. Recently a recording of our song “Corazon” mentioned in issue 63 of this magazine, is currently being used by “Children for Peace” one of the leading international charities based in Rome. We’re honoured by the recognition of this complex and compelling music and it can be seen on this video at www.marbellamarbella.es. David Mair‘s talent, versatility and personality has made him one of the best known and respected musicians on the coast, and we wish him lots of luck for many years to come. Dario’s original article is also available for you read.